CA78｜Digital Pianos｜Products｜Kawai Musical Instruments Manufacturing Co., Ltd.
Concert Grand authenticity for ambitious pianists. Embracing many of the long-established principles associated with an acoustic piano, the Grand Feel II keyboard action utilised by the CA78 combines realistic materials, motion, and mechanism to recreate the exceptional touch of the finest concert grand pianos. All eighty-eight black and white keys are crafted entirely from long pieces of wood, with finely textured ivory and ebony-like surfaces applied to absorb moisture and assist control. Each wooden key pivots smoothly on a balance pin – the ends rising and falling to replicate the familiar ‘seesaw’ motion of an acoustic piano action. When pressed, the back of the key lifts, triggering a grade-weighted hammer to strike a pressure switch. The amount of force applied to this switch is then measured, and the corresponding note played with authentic tonal character and volume. In addition to featuring extended, fully wooden keys, Grand Feel keyboard actions also boast some of the longest key pivot lengths – matching that of a Kawai grand piano. This extended key pivot length provides a more evenly balanced touch weight from the front to the rear of each key, allowing greater fluency and expressive control, while also minimising the need to readjust one’s technique when playing an acoustic grand piano. In addition to grade-weighted hammers, the Grand Feel II keyboard action also features graded counterweights attached towards the front of all 88 black and white keys. The Grand Feel II keyboard action also features an accurate triple-sensor key detection system for enhanced playing realism. 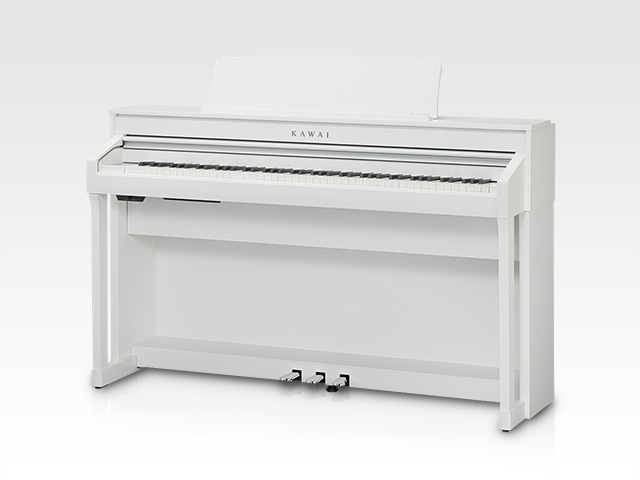 The exceptional CA78 features Kawai’s highly regarded Ivory Touch white key surfaces as standard. This finely textured material gently absorbs fingertip perspiration and oils to assist playing control, and possesses a natural, matte finish that is smooth but not slippery. 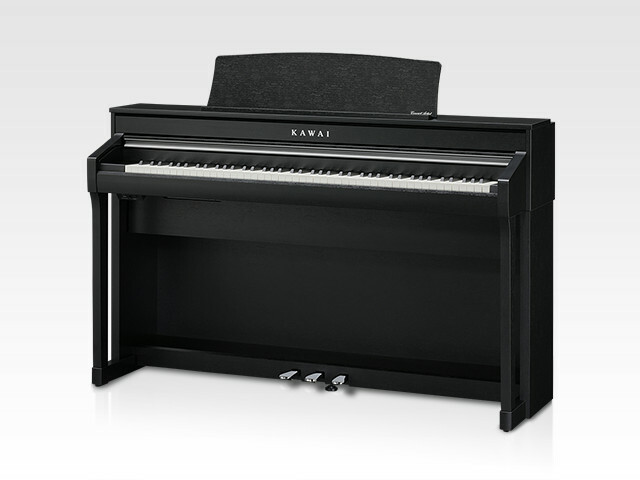 To complement these premium white keys, Kawai has also developed Ebony Touch, an all-new black key material that reproduces the finely-textured grain and rich lustre of real ebony wood. The result is a keyboard surface that looks and feels as luxurious as some of the world’s finest grand pianos, inspiring musicians of all levels to become better pianists. As the most authentic digital piano keyboard action, Grand Feel II even reproduces the ‘let-off’ characteristic of acoustic piano actions. This subtle ‘notch’ sensation can be felt when playing the keys of a grand piano very gently, and may be used by experienced pianists to aid control when playing pianissimo passages. In addition, the Grand Feel II action supports playing notes from the let-off point (sometimes referred to as playing ‘off the jack’), allowing the most advanced piano techniques to be performed. The magnificent tone of Kawai’s flagship Shigeru Kawai SK-EX full concert grand piano is at the heart of the Concert Artist CA78. Widely regarded as the ‘premier pianos of Japan’, Shigeru Kawai instruments grace the stages of concert halls and musical institutions throughout the world, and are prized for their tonal clarity and exceptional dynamic range. In order to faithfully reproduce the stunning sound of a Shigeru Kawai concert grand piano digitally, Kawai has developed SK-EX Rendering. This brand new piano-only sound engine focusses the Concert Artist’s DSP power, combining multi-channel, 88-key sampling with the latest resonance modelling technology to deliver pure acoustic piano authenticity. SK-EX Rendering is enabled by selecting the dedicated Pianist Mode, which features ten differently prepared piano characters ranging from Classic and Romantic, to Pop, Jazz, and even Boogie. While digital pianos typically employ single-point stereo sampling, the SK-EX Rendering engine’s multi-channel sampling captures the sound from different points of the Shigeru Kawai concert grand. This modern technique not only allows a broader range of tonal characteristics to be recorded and reproduced, but also improves the connection felt between the keyboard and piano sound, resulting in a more lively and authentic response to changes in dynamics. This naturally expressive Shigeru Kawai sound is further enriched by newly developed resonance algorithms, which physically model the complex tonal interactions produced by the strings, dampers, and various other parts of an acoustic piano. Unlike other resonance simulations, SK-EX Rendering generates resonances for the damper pedal and all 88 keys progressively (i.e. in gradual amounts, not simply on or off), allowing the Concert Artist to behave – and therefore be controlled – more like an acoustic piano. Accompanying the dedicated Pianist Mode, the CA78 also features the flexible Sound Mode, which offers a broader selection of instrument voices, and the ability to combine sounds. Sound Mode utilises Kawai’s highly regarded Harmonic Imaging XL sound engine to showcase a selection of alternative acoustic pianos captured with full 88-key stereo sampling. The Kawai EX full concert grand piano has frequently been selected by professional pianists in such prestigious events as the Chopin, Tchaikovsky, and Rubinstein international piano competitions, while the Shigeru Kawai SK-5 chamber grand and Kawai K-60 upright allow performers to enjoy the contrasting tonal characteristics of various different piano sizes and voicing configurations. The CA78’s powerful Virtual Technician function simulates these refinements digitally, allowing discerning musicians to shape aspects of the selected piano’s character to suit their personal preferences. 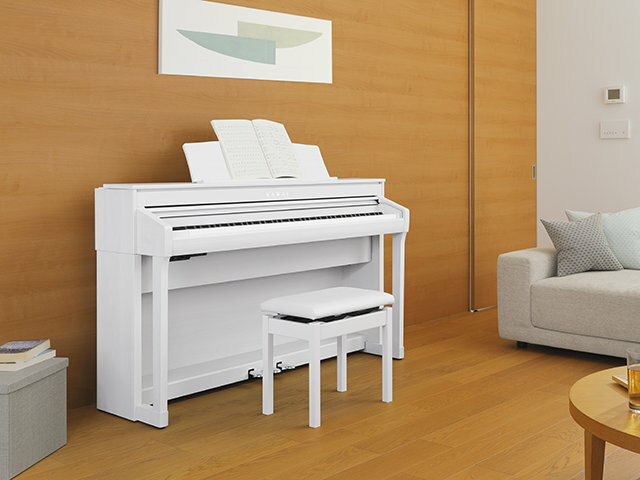 Supplementing the beautiful acoustic piano voices, the CA78’s Sound Mode also features an excellent selection of additional instruments, ranging from electric pianos and drawbar or church organs, to strings, human choirs, and synth pads, inviting musicians to add greater variety to their performances. Furthermore, the Dual playing mode also allows two different sounds, such as grand piano and strings, to be layered together for a richer, more luscious tone, while the Split and Four Hands modes divide the keyboard into two independent sections with separate sounds for each. The volume balances and other settings for each playing mode can also be easily adjusted using the instrument’s intuitive touchscreen interface. Developed in collaboration with Onkyo, one of Japan’s leading premium audio equipment manufacturers, the CA78 is one of the first Kawai musical instruments to utilise specialist components designed for high-end audio reproduction. With cutting-edge technologies such as 1-bit processing, dual DAC signal conversion, and Onkyo’s DIDRC filtering, the Concert Artist’s optimised power amplifiers reproduce the Shigeru Kawai grand piano sound with stunning clarity, richness, and power, while the high-performance Discrete SpectraModule™ headphone amplifier ensures the finest quality listening experience, even when playing in privacy. Increases the sound resolution, resulting in a more ‘analogue’ tonal quality that is less fatiguing than standard PCM audio. Decode the left and right audio channels separately, ensuring the most precise digital-analogue signal conversion. Unique filtering technology that eliminates digital-specific noise, preserving the special harmonic characteristics of a grand piano. Two separate amplifier modules that deliver sound energy with maximum efficiency. These Onkyo developed amplifiers utilise high specification components for improved richness and presence, with a vast dynamic range that is free of distortion. A unique headphone amplifier developed by Onkyo using the latest audio technologies. This class-leading amplifier features a 500 V/µs slew-rate, ensuring ultra-fast response to rapid changes in sound level, fully reproducing the piano’s dynamic characteristics. The latest Concert Artist instruments feature high fidelity speaker systems that have been specially designed to deliver deep bass and crisp treble frequencies. The high specification CA78 boasts an improved 6-speaker output system, with lower range frequencies delivered through the underside of the instrument, and mid and high frequencies projected outward via top-mounted and front-facing speakers. The result is a broad, resonating tone that closely mirrors the immersive sound field of an acoustic grand piano. Complementing the instrument’s class-leading Grand Feel II keyboard action and stunning SK-EX Rendering piano sound engine, the CA78 also offers a strong selection of digital features that further enhance one’s musical enjoyment. Full Bluetooth® connectivity and USB audio record/playback allows musicians to extend the functionality of their piano, or play-along with their favourite artists, while the convenient metronome and integrated lesson functions, featuring classical etudes and Alfred course books, ensure that regular practise is both productive and engaging for aspiring pianists. All functions are accessible from the CA78’s 5″ touchscreen display, which allows sounds and settings to be selected from an attractive user interface simply by tapping or swiping the display with a finger. The screen can also be set to turn off automatically while playing, thus preserving the instruments’ acoustic piano-like appearance, and minimising any visual distractions to the performer. In addition to standard USB and MIDI jacks for connecting to computers or other instruments, the CA78 also features integrated Bluetooth® MIDI and Audio technologies that allow the instrument to communicate with supported smart devices wirelessly. Once paired with a phone, tablet, or laptop, Concert Artist owners can enjoy a wide variety of exciting music-related apps that enhance their learning and playing experience, or stream audio from songs and videos directly through the instruments’ premium amplifier and speaker systems without the need to connect additional cables. In addition to wireless functionality, the Concert Artist is also equipped with USB ports that allow the instrument to be connected directly to a computer for MIDI use, or to load and save data to USB memory devices. This latter USB to Device functionality allows recorder songs stored within internal memory to be safely preserved on USB flash drives, or for standard MIDI files (SMF) downloaded from the internet to be played back and enjoyed using the instrument’s exquisite Harmonic Imaging XL sounds without additional hardware or cables. USB memory devices can also be used to play back MP3 or WAV audio files, allowing musicians to learn the chords or melody for a new piece, or simply enjoy playing along with their favourite songs. It is even possible to record entire performances (including external Line In and Bluetooth sources) as MP3 or WAV audio files for emailing to family and friends, or casual listening away from the piano. The CA78’s convenient lesson function allows aspiring pianists to learn piano with classical Czerny, Burgmüller, Beyer, Bach, Beethoven, and Chopin etudes, or a collection of songs from the popular Alfred’s Basic, Adult, and Premier course books. With a strong emphasis on acoustic piano realism, the Concert Artist also features traditional finger exercises, scales, and warm-up drills, and includes companion books for all classical scores to further aid one’s piano development. 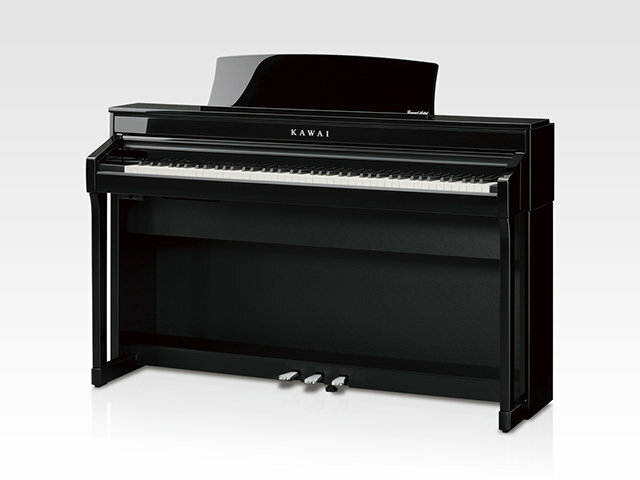 Reinforcing the Concert Artist’s reputation as the most realistic digital piano is Kawai’s Grand Feel Pedal System. This unique feature accurately replicates the position and individual weighting of the damper, soft, and sostenuto pedals of the Shigeru Kawai SK-EX concert grand piano to further enhance the CA78’s acoustic piano-like authenticity. Moreover, it is also possible to adjust the half-pedal sensitivity of the damper pedal, and effectiveness of the soft pedal using dedicated Virtual Technician parameters, allowing experienced pianists to personalise the instrument’s response to match their individual pedalling technique. The CA78’s Spatial Headphone Sound (SHS) technology enhances the depth and realism of the instrument’s sound when listening through headphones or earphones. The player can select one of three different acoustic presets that adjust the spatial positioning of the sound, while also helping to reduce auditory fatigue when using earphones or headphones for extended periods of time. In addition, the CA78 also allows players to specify the type of headphones connected (Open, Semi-open, Closed, In-Ear, Canal, etc.) to ensure an optimal listening experience. Sitting down at the Concert Artist, the first thing that strikes the player is the instrument’s flat fascia and tall upper board, giving the impression of a traditional grand piano and immediately elevating the musical aspirations of the performer. The distinctive KAWAI logo – representing over 90 years of acoustic piano crafting excellence – adorns the CA78’s fallboard, its metallic finish glimmers in the light, capturing the graceful movements of the player’s hands below. The instrument’s broad music rest is designed to accommodate the most ambitious musical works, with smoothly rounded edges and simulated leather lining the base. As with a grand piano, the viewing angle of the Concert Artist’s music rest can be adjusted to suit the performer’s height and playing position, or even set to a special ‘composer desk’ angle for greater convenience when notating scores or sketching musical ideas. Subtly concealing its impressive digital features, the Concert Artist’s touchscreen control panel is discreetly embedded within the piano’s left cheek block. This helps to preserve the instrument’s grand appearance, and allows performers to enjoy the simple pleasure of playing music without the distraction of flashing lights and rows of buttons found on most digital pianos. And for added convenience, the CA78’s USB and dual headphone jacks are separated from the instrument’s main connections panel, mounted beneath the keyboard in an easily accessible position, yet hidden from the player’s eye-line. The CA78 is available in a choice of four attractive cabinet finishes: Premium Rosewood, Premium Satin Black, Premium Satin White, and luxurious Ebony Polish, allowing musicians to coordinate their piano with a range of modern interiors.